Board index ‹ RPGs and Other Games ‹ Downloads ‹ Adventures! Simple solution, roll a d6 for each room, print out some random pages from each edition of grimtooth's traps and fold them up, create ten critters using the random esoteric creature generator, on a roll of 1 pick a creature, on a roll of 2 or 3 pick a trap, watch the players weep openly. PCs start in Area 1. Each PC has been captured and is being held for ransom. They wear no armor, but are dressed in rough homespun cloth. They are bound, gagged, and blindfolded. They do not know each other. The room is sparsely furnished; the PCs are gagged, blindfolded, and chained to the floor. 1d6+1 bandits [AC 8 MV 12" HD 1 N] are stationed here; one of them is Grummish [AC 8 MV 12" HD 1 N], a half-wit whose only job is to hold the keys and feed the prisoners. Once a day, he removes each PC's gag in turn and shovels a bowl of rancid gruel into each one’s mouth. Only one PC is ungaged & fed at a time. The bandits spend their time playing games of chance, lying about their exploits, and comparing notes on local doxies. The northeastern door opens on a tunnel leading to an impassable fissure that extends hundreds of miles into the earth. Faint noxious fumes smelling of burnt bodies waft up from below. This small room houses tables and shelves of mostly spoiled meats and rotting vegetables, which Grummish uses to prepare the prisoners’s daily portion. There are some common kitchen tools, such as butcher knives, cleavers, and spits, but nothing of real value. A stack of cookbooks rests on a shelf; among them is a leather-bound spellbook written in cryptic elven runes. Rotted rope-strung bunks line three walls and pieces of smashed chests and broken trunks scatter the floor. Various graffiti is scrawled on the walls in old grease, the most notable of which reads “GSAMARKAND WAZ HEER” in Orcish. The room contains nothing of value. The PCs’ armor, weapons, and other equipment is stored here, mixed in with other armaments. There is an inventory list, written in Common, hanging on the wall by a thin wire; it lists each item located here. Several items have been crossed off the list and the PCs’ equipment is written in neat block letters on page 16. Everything is broken and worthless except the PCs’ equipment and a silver dagger +1 that does not appear on the inventory list. Coiled in the back corner is a nest of 6 large centipedes [AC 9 MV 6" HD 1/2 N]. They will emerge at any rattling sound or if the barrel in front of their nest is moved. Under the centipede nest is 567 sp, 207gp, and a ruby worth 112 gp. Locked in this room are 7 naked, disgruntled dwarves [AC 9 MV 9" HD 4 L] arranged in a circle facing each other. They are blindfolded and chained to the floor, and their beards have been knotted together in a rat king of epic proportions. A pair of rusty scissors lays on the floor next to each dwarf. They are ungagged but refuse to talk to each other. Each will parley only with the PCs. They have been captive for 2 years. Their names are Gilliwag, Gillifrid, Gilliwif, Gilliwd, Gilligog, Gillivak, and Bob. They do not know each other but were imprisoned separately and their beards then hopelessly interwoven with the others. They can recount interactions with at least 3 captors; 1 spoke rough Dwarvish and the others smelled strongly of Orc, but they are unsure if they are Orcs. If freed and allowed to leave, they will be ever grateful and arm themselves as best they can from Area 4; it is then possible to run into this group again elsewhere in the dungeon. If their beards were cut freeing them, they will attack the PCs on sight once they are armed (see Random Encounter Table). This large room is a treasury with 2,400 sp, 1,200 gp, various gems worth 759 gp, and a delicately crafted ruby-encrusted coronet missing one ruby in the room, worth 456 gp. Everything is covered by a large Green Slime [AC 9 MV n/a HD 3 N]. The half-digested remains of 3 human bandits sit putrefying ten steps into the room, the laps of each loaded with gold and gems. In the center of the room, blindfolded, gagged, and suspended from chains running from her arms and legs to the four corners of the room is a naked female elf. The manacles on each limb are arsenic-plated, and the chains are made of adamantium-infused mithril. The elf is bruised and battered, her face a pulpy mess of half-healed scabs. She is missing several teeth and her tongue. Three fingers from her right hand have been recently sawed off; their stumps are raw and bloated with foul-smelling pus. She hangs limply, unconscious. This is Lanyah Turnbow, master bowyer to the Merwinian Elves, a Amazonian-like tribe from rugged mountain reaches. She has been held prisoner for a little over a year. She is an expert marksman with all types of bows, but prefers the short bow. Beneath Turnbow, etched on the floor, is an enormous pentacle, stretching from doorway to doorway. Entrapped within is an Efretti [AC 4 MV 9/24" HD 10 C] tasked with keeping Turnbow in the room. If any attempt is made to free Turnbow, the Efretti will manifest and attack. If successfully freed, Turnbow will reveal the path to the complex’s entrance (Area 13). If healed, she will insist on joining the party to seek revenge, but will need to be equipped. Turnbow is a 4th level fighter/magic user [AC 7 MV 12" HD 4 L]. Her spellbook is in Area 2; it contains Read Magic, Comprehend Languages, Color Spray, Gazeback, Continuous Light, Protection from Missiles. In the center of this area is a large free-standing fireplace, its chimney funneling smoke up and out of the room by way of a complex series of air ducts. Suspended over a roaring fire are 2 charred elf corpses, missing various bits and pieces. 1d12 orcs [AC 7 MV 9" HD 1 C] hunch around the fire, singing drinking songs. Occasionally an orc pulls a hunk off a corpse and gnaws away. Some of the orcs wear armor or wield weapons of elvish provenance. In the southeast corner are the bodies of 3 orcs dressed in ornate battle regalia and laid out in stodgy wooden coffins. 12 black and red Mourning Candles surround each coffin, 3 are unlit and the other 9 are each 3/4 melted. One of the orcs is of obvious high rank; this was Gsamarkand, an infamous warrior, and 2 of his lieutenants. They are all missing their left hands and the left side of their faces, as if they were blasted away. The right hand of each clenches a parchment listing their great deeds in life and the particulars of their deaths. Gsamarkand’s list is written on the back of a Scroll of Unknotting. The orcs are now led by Grawlmulk [AC 6 MV 9" HD 2 C], the newly-promoted leader of the squad. He is singing a drunken song, waving a sword around and bawling like a baby. He posesses a Potion of Instant Sobering. The roasted elves were Lathia Talenwood and Lydia Tirentor, apprentices of the elf held prisoner in Area 8. The orcs are flat-out broke. The floor between the 2 doors of this ceremonial hall is littered with 1d100 dwarf skeletons and 1d30 elf skeletons [AC 8 MV 6" HD 1/2 N]. It is impossible to enter or exit the room on foot without disturbing them. If but one bone is moved, the skeletons animate and attack. The elf skeletons respect the boundary of the floor-to-ceiling tapestry at the end of the room. Behind the curtain is a human-sized statue of an emaciated and disfigured humanoid with a head full of innumerable eyes, including a large, forward-facing cyclops-like eye. Tears drip from some of the eyes, blood from others, and a green, hissing acid from others still. The figure appears to be sitting zazen, in a state of deep meditation. The statue cannot be moved. This is a statue of the Jale God, sitting on his chklor throne. Should it be touched, various eyes will open and roll around and a low, resonant humming sound will fill the air from all directions. PCs touching the statue must Save vs. Paralysis; failure results in 1d6 hours of a splitting migraine that inflicts a –3 to all actions requiring concentration, including combat. In a small hidden compartment on the base of the statue is a drawer containing a Ring of Repel Undead. Scattered on the floor under the bones are 1,278 sp. Both doors to this room are of heavy, re-enforced iron and slotted for viewing and shooting. 2 goblins look out each door, 1 above and 1 below [AC 7 MV 9" HD 1-1 C]. In addition to the goblins looking peering out each door, 2 more goblins flank the inside of each door [AC 7 MV 9" HD 1-1 C]. This room itself is sunken below the rest of the complex and is occupied by a troop of 1d30+8 goblins in ragtag armor [AC 7 MV 9" HD 1-1 C]. The goblins are lead by Gorsh, a goblin guard captain [AC 6 MV 9" HD 1-1 C], and Gort [AC 5 MV 9" HD 1-1 C], a goblin sergeant-at-arms. They are incredibly jumpy and highly alert. 1. Grummish is an idiot. 3. Hallo! Me is Grummish! 7. No one here but us goblins. 8. All hail Gsamarakand the Great! 9. Dwillig is a traitor, a traitor, a traitor! 10. Eatsie, eatsie, little elfie! 11. Gwallnough is a doodyhead. 12. Has anybody seen my sweet Ma-moo? The goblins continually disparage Orcs, muttering about loaded dice and lousy bets. The southern door opens on a hallway under Area 1; a short staircase therein leads to the current exit. Between them, the goblins have 1,327 cp. Around the corner at the end of this hallway is a shower head, a pull chain, and a drain in the floor. The walls are spattered with specks of chalky mud. A used, rough bar of rosemary & peppermint scented lye soap attached to a short length of hemp rope hangs from the shower head. Pulling the chain releases a seven minute long flow of warm, clean water. Every third pull, a Cloudkill spell is triggered and a torrent of poisonous gas is released instead. This was once the main entryway into the cavern complex. Unfortunately, the exit is now sealed by a tunnel collapse and an impassible, muddy rockslide several tons in volume. There is evidence of an attempt to re-open the tunnel (discarded shovels, snapped supports, etc.) but everything is in a state of disrepair and covered in thick, chalky, dried mud. The floors and walls of this area are encrusted with the muddy, scattered skeletons of hundreds of orcs and goblins. Slithering over them are 2d30 large, venomous mudsnakes [AC 8 MV 6/6" HD 1/2 N], engaged in a mating frenzy. Mudsnakes are 10-ft. long and are nearly undetectable in mud when still. Their bites cause 1d6 damage and bitten PCs must also Save vs. Poison. The mating mudsnakes have worked the floor into a thick, muddy froth; PCs with less than 10 DEX suffer –3 to all combat rolls in this area due to balance issues. The southern exit leads to an unfinished spiral staircase that leads nowhere. The entry chamber of this area is richly decorated with intricate murals depicting orc battles and goblin raids; close examination will reveal the orcs have been defaced with mustaches, spectacles, buckteeth, etc. An enormous freestanding 10-ft. wide by 30-ft. tall stone statue of an unknown goblin god occupies a place of honor in the main chamber. Embedded in the floor of the northern corridor into the main chamber is a trigger which will cause the statue in the main cavern to topple forward 30 seconds after it is released. The pool of fresh, warm water is fed by a trickling spring. Sprinkled along the bottom of the pool are 4,234 cp. The door is rusty and worn with age but has a brand new lock. Empty racks and shelves occupy most of the room, covered in dust and cobwebs. The ceiling is covered in fresh webs from 3d8 large spiders [AC 8 MV 6/15" HD 1/2 N]. Wrapped in spider-silk cocoons are the remains of several goblins, dwarves, and elves in various states of decay. Wrapped up in the corpses are various coin purses containing 1,024 cp, 512 sp, and 256 gp. One of the dwarf corpses wears a chainmail hauberk +1; a half-composed elf corpse clutches a half-empty Quiver of Light. The door is relatively new; it opens on a room identical in size and shape to Area 16. Racks and shelves occupy most of the room, full of various ordinary wares, including one large, expensive-looking tureen on the floor. Moving the tureen pulls taught an arsenic-laced thread that triggers a crossbow aimed at the door. The tureen is worth 30 sp. The room contains nothing of value other than empty pottery, bolts of cloth, and other mundane items. In the center of the room is a large, battered, rectangular table with a white line painted lengthwise down the middle. Laying squarely in the middle of the table on the white line is a massive, mud-splattered crystal that emits a weird, ulfire glow. Standing on the east side of the table are 1d8 Orcs [AC 7 MV 9" HD 1 C] and 3 bandits [AC 8 MV 12" HD 1 N]. On the west side of the table are 1d8 Goblins [AC 7 MV 9" HD 1-1 C] and 2 bandits [AC 8 MV 12" HD 1 N]. Standing at the northern end of the table are Gwallnough, an Orc Chieftain [AC 4 MV 9" HD 4 C] and Gozmirk, a Goblin Chieftain [AC 4 MV 9" HD 3 C]; the two leaders are engaged in a furious shouting match, both pointing at the southern end of the table. The southern end of the room is occupied by a mud-covered Juggernaut in the form of a massive cyclops with drill bits for hands; its eye is missing and it is currently inert [AC 2 MV 9" HD 37 N]. On the Juggernaut’s back, under a thick layer of mud, the phrase “Property of Gilliwd Dwillig & Co.” is carved in dwarven runes. The crystal is worth 10,724gp. *Encounters should only occur once each. ‡Encounter only occurs if dwarves from Area 6 are freed. Mourning Candles: Placed at the head, foot, left and right of a corpse; all but the light at the head are lit. If the three lit candles are allowed to burn until completely extinguished, it is assured that the deceased will not be animated, resurrected, or summoned, or interrogated from beyond the grave. Worth 75gp each. Potion of Instant Sobering: 1 dose instantly removes all effects of alcoholic intoxication from any single creature up to 500lbs. Quiver of Light: Contains 20 bolts of lightning magically encased in arrow form. Once fired, the arrows transform into lightning bolts in flight and pass completely through their targets. They may ricochet off hard surfaces twice, perhaps even doubling back. Does 1d6 damage per strike, up to 3 strikes per arrow (original strike plus up to two ricochets). Ring of Repel Undead: A small lead pinky ring; the wearer is able to move unmolested among all undead as if invisible. Wearing the ring results in a –3 to STR while worn. Scroll of Unknotting: (affects: knots, range: 6 ft.) Undoes any knot of fiber, fur, hair, or other material within range. Last edited by Vlark on Sat Mar 19, 2016 5:07 pm, edited 1 time in total. EDIT: whoops! I just now noticed that new forum members have to have their posts approved--sorry about the double post! Last edited by Vlark on Fri Jan 09, 2015 12:37 am, edited 1 time in total. verhaden wrote: I created a map over on Daves Mapper using Dyson's tiles. 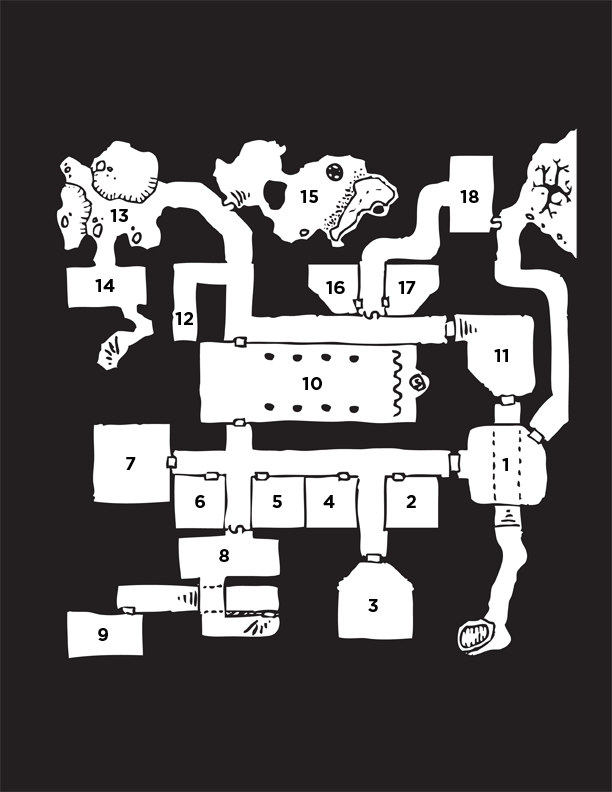 Then I edited the map, brought in elements from other (Dyson) tiles, and then live traced the end result in Illustrator so I could easily scale the dungeon for printing purposes. Can I submit your map along with the adventure I wrote for it to Underworld Lore (https://plus.google.com/u/0/communities ... 2417152465) for a future issue (most likely issue 6)? If yes, how would you like to be credited? Sorry! Let me know if it's not too late and I can provide a print ready file for you. However, as I mentioned in my original post, this was a filtered map created from Dave's Mapper using Dyson's tiles. All tiles are owned by their respective artists and used here with permission from the artist. By default, they are licensed for personal use only. For sharing and commercial usage, some artists have provided licenses for their tiles in their profiles. For those that don't — or to ask for permission beyond what the default licenses allow — e-mail Dave and he will put you in contact with the appropriate artist(s). I think you'd have to clear it with them to use the map in a publication.